This large home is in Slide Creek, a gated community with a swimming pool and spa open year round, and close to the Lake. The outdoor living area adjoins the seasonal stream so that you feel you are stepping into the woods when you walk out the sliding door. New patio furniture, a custom designed rock garden and the towering pines add to your al fresco experience. The home has 3 bedroom, 2.5 baths, and amenities that include a 46-inch Flat Screen in bedroom, air conditioning, gas fireplace, Dish TV with premium movie channels, 61" hi def flat screen television, Blue Ray DVD, VCR, microwave, dishwasher, washer & dryer, ping pong table, bean bag game, foosball table, access to the 2 car garage plus 2 parking spaces, propane BBQ, 2nd floor deck with furniture & downstairs covered patio with furniture. 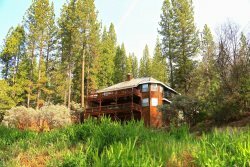 The home is near Falls Beach, and is close to Oakhurst, with quick access to Yosemite. No Smoking, No pets.